25% Off Kit Special — Order Kits in All Flavors! 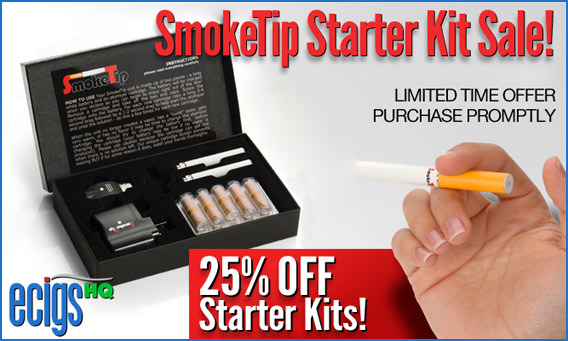 For a limited time SmokeTip is offering 25% OFF when you order a new kit! During the sale period, a new kit will cost only $44.95. No coupon code is necessary — just add the kit to your shopping cart and the discounted price will be charged. This offer can be shared with family and friends, but act now, offer ends soon! SmokeTip Batteries are GUARANTEED FOR LIFE! But it gets better! Every time you order 3 or more 10-packs of the highly-rated SmokeTip Cartridges you get 1 FREE BATTERY. That’s an unbeatable deal! Don’t miss out on these limited time offers. Click the banner above or the link below to stock up on savings today. Type ecigshq into the box marked Redeem Coupon and you will receive a 10% discount on your SmokeTip Starter Kit purchase. This coupon code offer may be withdrawn without notice — so please place your order promptly.